Just a tiny bit obsessed about pretty boys killing monsters. It doesn't sink in until later. Until Dad is gone and Mom has retreated to cry herself to sleep in her room and Sam looks like he's going to burst into tears if Dean so much as looks at him funny. But hell, Dean feels like that too, like he's just on the very edge of some kind of breakdown and it wouldn't take much to push him over. Then he sees Sam running his finger through the small pile of iridescent white dust on the table, and he's got that look of desperate, haunted terror again, and Dean thinks oh, yeah, I blew that, didn't I; that was supposed to be about Michael. But no. That's not fair; that's not right. "It was worth it," he says. Sam looks up, startled, bruised face and hollowed-out, mourning eyes. "Huh?" "It was worth it. I know we were hoping the pearl would. You know. Michael. But it was worth it. I'd do it again." "Yeah." Sam sighs and turns back to the remains of the pearl. "We'll find another way to deal with Michael. Seeing Dad again. That was... that was good. That was important." But the thing is, Dean really did get what he wanted. And maybe it's Sam's fault. Maybe Sam's the one who put it in his head when he asked if Dean wanted to wait for Mom, because he wasn't even thinking about Mom until his brother opened that door, and then he couldn't help but think about the other two entities who thought they were giving him what he wanted most in this world. 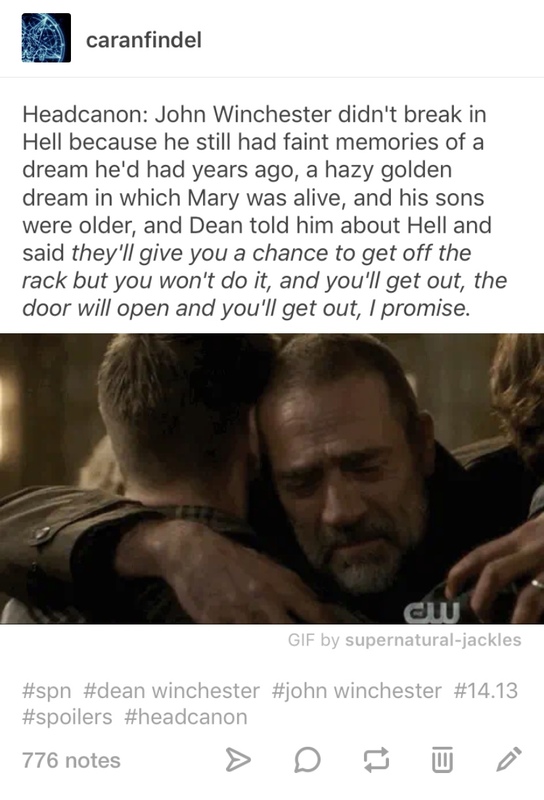 And neither Amara nor the djinn really got it, because what Dean wanted wasn't to have his mother back, what he wanted was a world where she had never died in the first place. A world where he and his family could all sit around the table and talk and laugh and eat Winchester Surprise and be together, be his family together. Or maybe it really is Dean's fault, because he couldn't bother to want rescue in the first place. Not when he knows it's not coming. When he told Sam let's go home, it wasn't because he really thought there might be some other way out. It was because he owed it to Sam to go out swinging, to let him think they'd tried everything, to not leave him alone and bereft wondering what if. No, Dean didn't get a miraculous rescue. He got a better goodbye, and that's the best he could have wished for. Because yes, I’m rewatching “Lebanon” on my day off. Remember, no spoilers in the comments, please! Ach, I bet that's *exactly* what was going through his mind during happy family dinner and I-love-you hugs. Rip my heart out why don't you?! A perfect look into Dean's mind.